So. . . in 1282, Sicilians around Palermo had had more than enough of their French overlords. 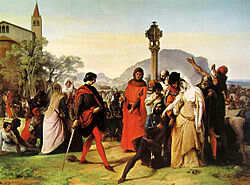 The Sicilian Vespers ensued, an uprising that started on the vigil before Easter when, it’s said, a French soldier took liberties with a Sicilian woman. Her husband objected, eliminating the Frenchman with extreme prejudice. His comrades objected, but were wildly outnumbered. Mass killing followed, with French soldiers, priests, friars, monks, possibly French anybodys were hauled into the street and made to pronounce the word “ciciri,” Sicilian for chickpeas (“ceci” in modern Italian). True French just couldn’t manage the “ch” sound and Sicilian “r” even, literally, to save their lives. Contemporary accounts list 3,000 French dead, all for the want of a “ch” and an “r.” A fatal shibboleth. Don’t let this happen to you. Pasta con Ceci. Easy and comforting, with many variants. Saute onion and garlic until soft. 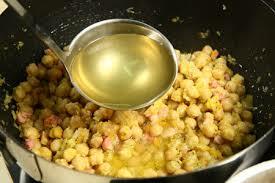 Add drained chick peas and water to barely cove. Salt and cover, checking often and adding water as needed until the chick peas begin to break down. You can also mash them to help the process along. Meanwhile cook the pasta, adding a bit of pasta water to the chickpeas. You are aiming for a lumpy, near-paste. Check salt, add oregano. You may add a bit of chopped hot pepper. Heavy or half and half is an option and a handful of washed, chopped spinach adds color, as will chopped tomatoes.